I can’t remember how long ago I read Around the World in Eighty Days by Jules Verne, but it was probably high school or even earlier. I’ve been meaning to reread it for a while now, for a very writerly reason! In my Phantom of the Opera reimagining, my protagonist Meg dreams of travel. The Phantom needs a Christmas gift for her, and I thought–Around the World in Eighty Days! Verne was a French author popular at the time. Perfect! Except I thought I ought to reread the book to make sure it really was perfect. The novel tells the tale of English gentleman Phileas Fogg and his (possibly) mad bet that he can travel around the world in a mere 80 days. Accompanied by French manservant Passepartout, Fogg travels east from London, through India to America, passing through a series of adventures and mishaps with perfect, imperturbable calm all the way. This is a strange and fun book. Like its protagonist Fogg, it is frequently quite calm and unperturbed and serenely explaining (in more detail than really necessary) the exact mathematical calculations enabling Fogg to pursue his goal. But like its secondary protagonist Passepartout, it also goes on wild flights of drama, including encounters with a murderous cult in India and an extremely bloody attack by Indians somewhere in the American west. Near the beginning I worried that this was going to be both dull and a poor gift for Meg because Fogg has no interest in seeing any of the world–preventing the reader from seeing it too. But that’s an early book issue; Verne seems to have been entirely disinterested in depicting Europe or the Middle East, and the detail picks up from India onwards. The drama increases the farther Fogg goes too. Despite how fast we can travel around the world now, there’s still something magical about Fogg’s rapid (at the time) travel. I think it’s the way he departs. He makes the bet at his club and sets off that very night. Even though I know intellectually that I could get in my car this moment, drive to the airport, book a flight and be in, say, China by tomorrow, there’s still something a little breathless about the idea of actually doing it. At the time Verne was writing, I’m sure it must have seemed amazingly wonderful that Fogg could simply set out and be in such different portions of the world so rapidly, that these far away places are actually so accessible. Well…if you have 20,000 pounds to spend, which Wikipedia tells me would be 1.6 million today!!! Rereading this explained to me why I struggle to think of Verne as a French author, and not a British one. I’ve only read a few of his books, this is my favorite, and it’s so British! I mean, it opens in a gentleman’s club in London! Its hero is an unflappable, highly intelligent and extremely capable British gentleman, while its French character is a good-hearted but comedic and not always very intelligent figure. Curious! Three other small moments in the book that struck me: one, Fogg remarks that he can travel without luggage, but of course it would be very different for a woman. I suspect Nellie Bly would beg to differ! Second, Verne must have picked up a train schedule for Northern California somewhere, because Fogg passes through a series of very small towns; living in Northern California, I know they’re all really here but I don’t know how Verne knew it. Third, I listened to this on audiobook, and someone played with the translation when Fogg made it back to London. The reader distinctly said the clocks were showing ten minutes to nine, instead of the famous and inexplicable “striking” that must have made the French wonder about British clocks that marked every ten minutes. I actually just read this for the first time earlier this year. I found it very cute. I read it because a local theater was producing a play adaptation, and I wanted to read the story first before going. The play was cute, too, and so perfect. My favorite local actor was playing Fogg, and Passepartout and Fix were just delightful. Most fun I’d had at a play in a while, ha. I read this 2 years ago for The Classics Club and really enjoyed it; especially funny, long-suffering Passepartout! I have recently read Journey to the Centre of the Earth – I didn’t like quite as much but still a fun read. 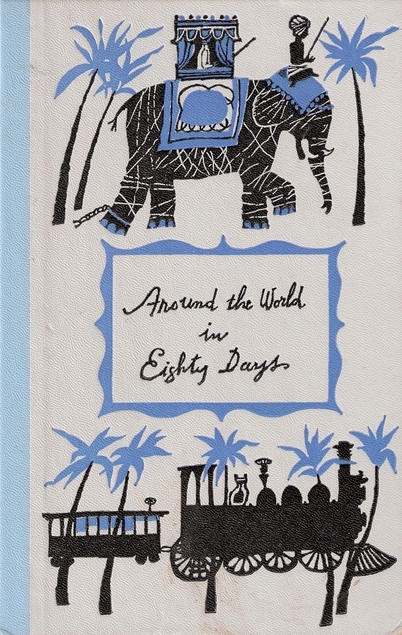 Around the World in 80 Days is an exciting read, unlike one of Verne’s other classics, 20 Thousand Leagues Under the Sea, which bogs down in unnecessary description and detail. The suspense builds as time starts running out for Fogg to meet his deadline. The way Verne resolves Fogg’s problem is sheer brilliance on the author’s part.. If you’ve seen the movie, you already know what it is. But if you haven’t yet seen the movie or read the book, then, if you do either, you’re in for a real gem of a conclusion. One other comment about the book. Verne has Fogg encounter snow an hour out of San Francisco by train. Still trying to figure out where that could be.